Figure A20. Calabria anomaly, interpreted as the Calabria slab, with (horizontal) [vertical] cross sections through (A)[D] the UUP07 p-wave) and (B)[D] the combined SL2013 and S40RTS s-wave models at 270 km; C) the location of the modern geological record that we interpret to have formed during the subduction of the slab. 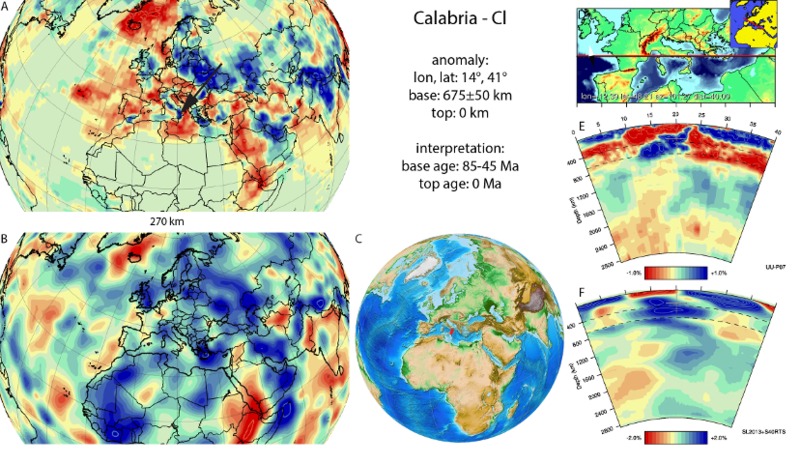 The Calabria anomaly (Figure A20) was first documented by Spakman (1986a), and Spakman et al., (1993), and has since been a prominent feature in tomographic models (De Jonge et al., 1994; Piromallo and Morelli, 1997; 2003; Carminati et al., 1998a; b; Faccenna et al., 2001; Spakman and Wortel, 2004; Chang et al., 2010). It is interpreted as the Calabria slab lying at the base of the upper mantle and that has not penetrated the lower mantle yet. It is still subducting along the Calabrian subduction zone. Estimates for the onset of northward subduction in the western Mediterranean vary from ~80 to 35 Ma (Rosenbaum et al., 2002b; Faccenna et al., 2004). A recent kinematic reconstruction of the western Mediterranean region of van Hinsbergen et al. (2014) showed that Africa-Iberia convergence, as estimated from the Atlantic ocean spreading reconstructions and corrected for intra-Iberian and intra-African shortening, started around 85 Ma, and was very slow until 45 Ma (<100 km), after which subduction accelerated. This led to inception of arc volcanism in Sardinia and in the Provence around 38 (Lustrino et al., 2009), and was followed by the inception of roll-back and back-arc extension around 30 Ma (Faccenna et al., 2001; 2004; Rosenbaum et al., 2002b; Rosenbaum and Lister, 2004; van Hinsbergen et al., 2014). Because it is uncertain when the slow convergence culminated in the inception of Calabrian subduction, we adopt a wide time range for the base of the Calabrian slab of 65±20 Ma. is it still active? to which speed?